One	of	the	most	interesting aspects of seeing these magnificent trains up close is the opportunity to see the working elements up close. The scaled down version in my Lionel train was pretty simple — the wheels were button size disks of steel mounted on a molded carriage. There is a lot more to the real thing. 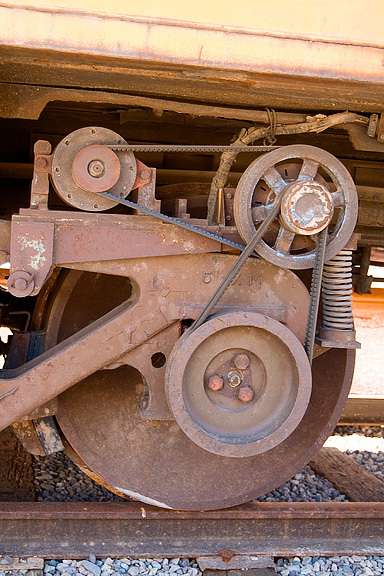 For instance, Steve pointed out a detail on the bogie (the chassis carrying the wheels) — specifically, the wheel bearings which are sealed with lubricant in modern trains — in the photo you can see the cover plate which provides that seal. 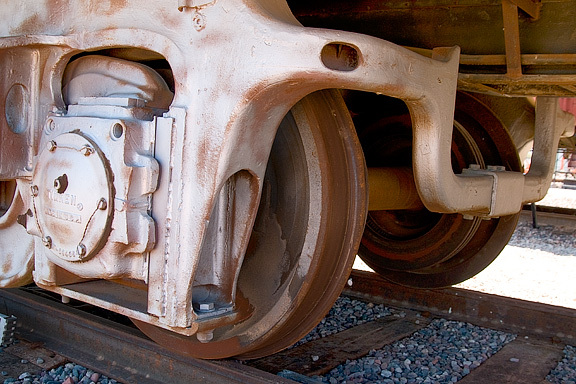 In older trains, it was not sealed — often experiencing overheating due to loss of lubricant. 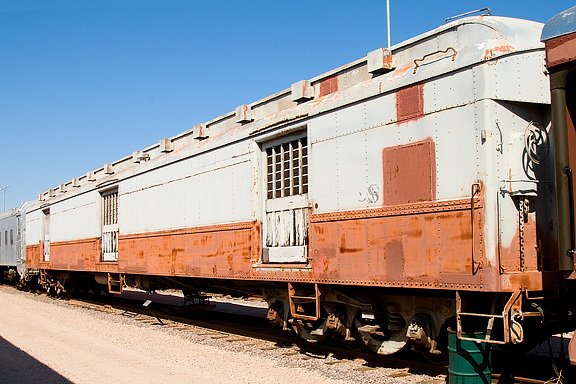 Railroad people called this a "hot box" — a condition which can result in a fire. And	once	you	get	a train started, you have to have a method of slowing it down and stopping it. 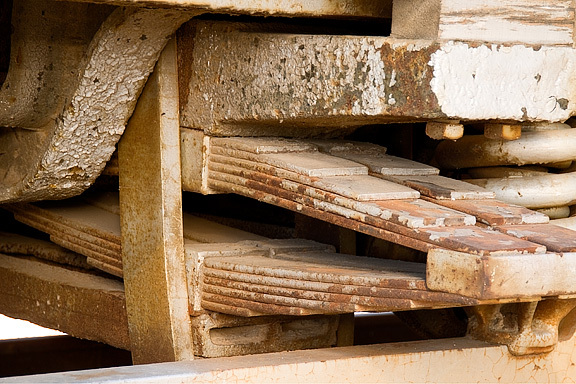 Here is a brake shoe not unlike those that used to be used on automobiles (most cars now use disk brakes). And if you think about it, if you only had brakes on the engine, the train could never stop in a reasonable distance. Thus you had to have brakes on each car. So how do you apply the brakes on all cars simultaneously? 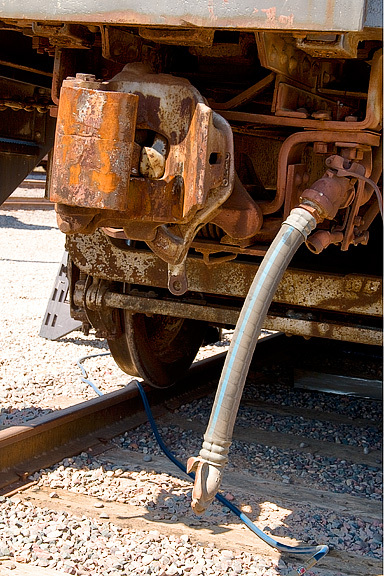 Well, how about using a "brake pipe" — interconnected pipes and hoses using air pressure to apply the brakes? This is one detail that was not in my Lionel set — there was only the coupling to connect the cars to each other and the locomotive. Of course my cars had a magnetic release so that when you position a coupler over an electromagnet embedded in the track and then pressed a button, the coupling would release and the cars would separate. I used to practice running the train at full speed over the electromagnet and pressing the button to uncouple the cars as the train was still moving. Simple things can capture the imagination of young kids. 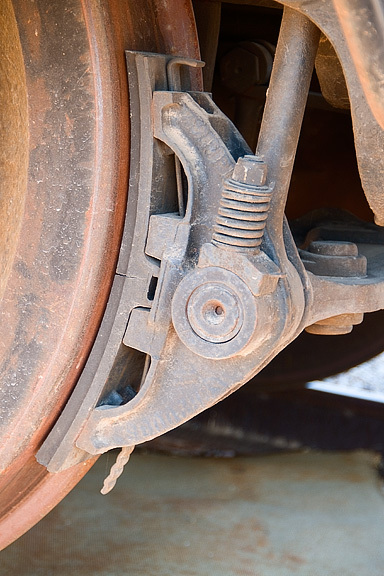 The cars needed a suspension just like an automobile or truck — here they used a combination of coil springs and leaf	springs. Just look how big these are! As I wondered about, absorbing it all, I found this set of pulleys and belts. I guessed and Steve confirmed that this is, in fact, an electrical generator. These were found on some cars, generating electricity to power the lights, etc. but also charging batteries which then powered the lights when the train stopped. This is the kind of detail I find so facinating — and which I would never have learned without a trip to the Arizona Railway Museum. As I wondered the far end of the park, I encountered this recent donation to the museum, a Superintendent's Car. 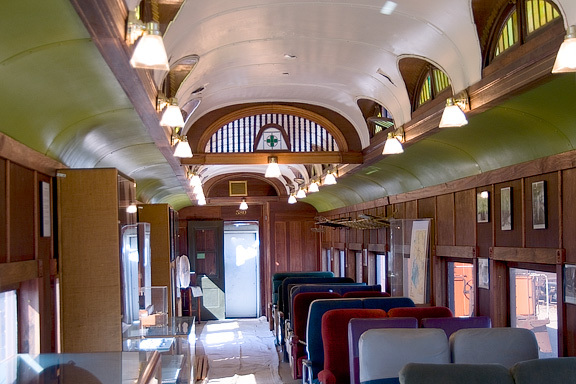 Built by Pullman and in service from 1927 to 1966. Clearly you can see it is in a state of disrepair — the volunteers are now beginning to work on refurbishment. Here	you	can	see another car that is undergoing restoration. Note how they have stripped down the exterior to the underlying structure. They want this restoration to last. Here is another car that has been partially restored — specifically a Horse	Car. The	car	was built as a heavyweight car with full opening end doors. It was later converted to a postal storage car. Steve told me that they have some of the original stable walls and have acquired some from another horse car. They also obtained a fiberglass horse that was sold at an unclaimed item auction by the Tempe Police Department. Cost? $1.00. This will be a real jewel in their collection once they complete the restoration. 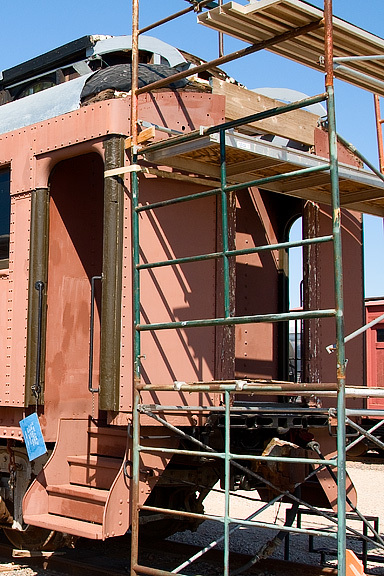 This caboose, TC & GB #1, is one of those restored jewels. 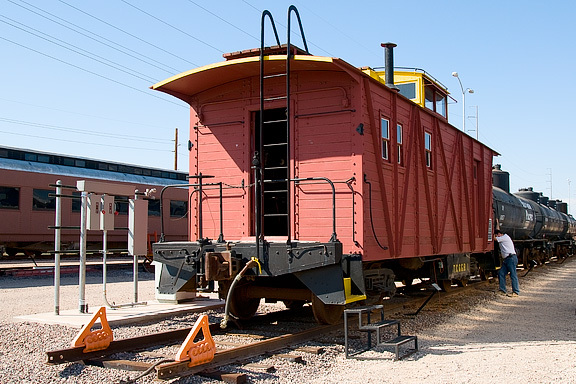 This is a woodside caboose built in the Phelps Dodge (copper mining company) shops in 1944. 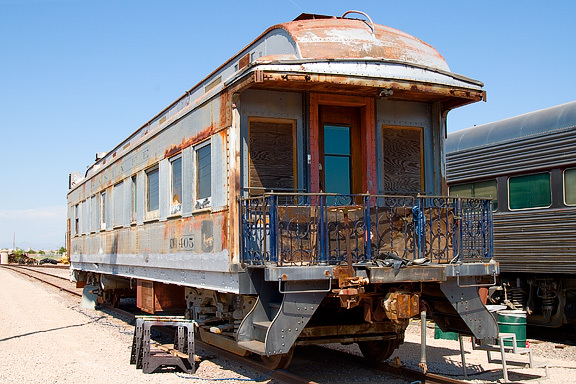 For many years, it was used for passenger service between Gila Bend and Ajo (both in Arizona). Note that the one-way fare was only $0.97 and round-trip fare was $1.94 — children were half-price. The interior configuration is quite unusual because there are separate bathrooms for men and women. Steve pointed out an insulated box for holding ice and a water dispenser with both room temperature and cold water (cooled by ice from that insulated box). There is a water tank on the roof providing water storage. One end of the car has side doors for loading freight. What an incredible job the volunteers have done restoring this car. 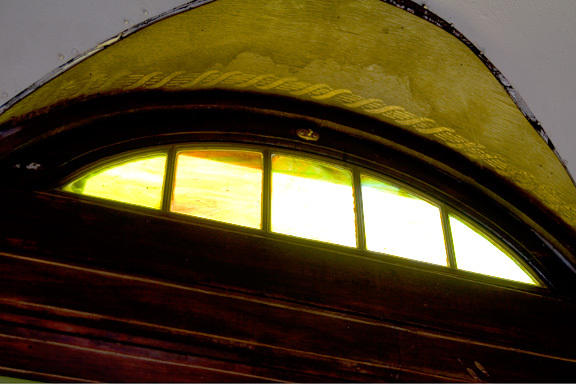 Note the stained glass in the domed part of the car. Incredible. This concludes our trip to the Arizona Railway Museum, for now. Steve has offered to give me a behind the scene tour. I look forward to scheduling that in the not-too-distant future.